I feel like there has been a lot of stress on the forum in the last few days and I wanted to lighten the mood. Since I have learned about SMP in the recent months, I've been trying to figure out if any celebs that I know have it. I feel like with the procedure being what it is today, there has to be some. I know HIS respects its clients and I don't want them to out anyone. I'm mainly just curious, outside of the ones who are popularized on HIS' website, are there any celebs that any of my forum buddies speculate have had an SMP procedure? I have believed for some time now that Pitbull has had SMP done. In previous years his scalp was mostly bald and flesh-colored on top, and in recent photos and videos he appears to have the presence of stubble and a hairline. Yea I think you are correct about the makeup artist b/c in some movies he seems to have a shadow on his scalp, and then you see him in photos or interviews and he is completely bald. Yes, exactly! I love that show, and ever since Coby Bell joined the cast I always thought he had SMP. I know what you mean about his hairline, it seemed to have transitioned for the better throughout his role on the show. We haven't treated Vin Diesel, and to be honest even if we had, we'd be sworn to secrecy no doubt. You know a treatments good when your questioning if its real or not when we know what SMP looks like. Vin Diesel is make up - in his films looks shaved but in tv interviews about those films is happy to be bald . Who do you have in mind bro? I was channel-surfing the other night and landed on an old rerun of the 90's show Blossom LOL, and experiencing some 90's nostalgia I watched for a bit and saw Joey Lawrence, immediately remembering that he had SMP some years ago. He was actually the first person I had ever heard of to have 'Hair Replication Tattooing', before I knew of HIS Hair. On older episodes of 'Melissa and Joey' he can be seen sporting his SMP look. Now I believe he wears a pretty good system. I have no idea who Joey Lawrence is but I wonder if Rosco has the timeline correct on those pictures. It looks like he has had a transplant and kept his hair cropped (and heavily fibred) as it "took". Pretty sure the place that do Melissa and Joey confirmed they used makeup on his head on the show, that's why it looked so horrifically bad. Has he actually had SMP done? I believe the makeup was to make his 'hair' seem more visible under studio lighting. http://www.buzzfeed.com/whitneyjefferson/the-joey-lawrence-hair-timeline. Yea, it is pretty much confirmed he had hair transplant procedure, and you are probably correct about the fibers. Ah, could be, maybe just makeup but many people speculated over whether or not he had SMP treatment, and I thought that he did. I guess just a bad makeup job though. Not sure if his current look is Hair Transplants or a combination of system and HT. Nooooooooo, Rosco! Joey was every girl's dream boyfriend. SHHH.....Do you hear that? listen carefully, that's the cracking of women's hearts all over the world. LOL, yes JuJu, you are spot on! I remember in the early 90s in the 'Blossom' days when every guy wanted to be him and every girl wanted to be with him. Back then when I had hair, I used to try and style mine like Joey's, but I never got quite the same reaction from the ladies as Joey did LOL. I Definitely didn't mean to negatively affect Joey's Heart throb image. This one's for you Joey Lawrence,- "WHOAA"
DOSEofFOUSEY has had it done. He is a Youtuber. He has had it done very recently. He was practically NW6 before. I believe he is from LA.....So likely had it done at a clinic there. I think in a few years a vast number of baldies will know more and more about SMP and as it gets more known with more and more people getting it done.....it will probably be quite common. But it is surprising how many people don't notice. You see the odd comment in this dudes video comment section questioning him about his SMP. But it seems somehow people on the most part don't notice. Wow thats some bad news right there! This guy is so famous. Hes going to let the world know about smp. The real question is what did he do to his eyebrows? Corey stoll who plays Ephraim on the Strain( vampire show) had a hair piece on the show and then had a episode where he had to shave his head and Came out with stubble and if you seen him on House Of Cards he is bald!! That is the show that made me look Into SMP!! Pretty sure he doesn't count as a celebrity, unless you accept his 10 seconds of fame when he appeared on my television... Its the time of year when they interview Tottenham fans, an EPL football team. Sky Sports News crews ambush passers by outside their ground for their views on the teams prospects of winning something this year. Far enough from the end of the season for that still to be a prospect to still find them in bullish mood - There was an absolutely nailed on SMP among them, a good one mind. Norwood 3/4 with a nice broken hairline. 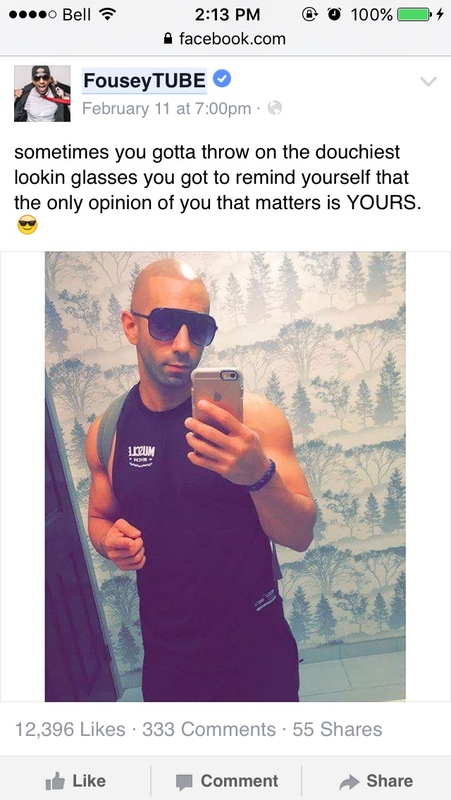 The guy Fousey Tube posted a picture on fb and a lot of people are laughing at his head shining. But just a few called him out for smp! Just people repeating the same thing. 'Your head is brighter than my future'. Not sure why people repeat that, maybe because he comes up with sayings all the time (I say all the time - I have just watched a few of his videos) and he seems to waffle on about life and philosophy crap. There are more positive comments than negative that directly comment about his 'hair'. Looking through all the comments maybe 5 - 10 questioned the 'hair'. It's amazing how many people don't notice the change. You would expect 90% of people to question it. Maybe it's because they are used to seeing him wearing a hat, though he has done plenty of videos without it. His SMP looks fine. If you met him for the first time and never knew he was previously bald. You would never know it was a Tattoo. Personally I think the hairline should be slightly further forward and broken up more, but these darker skinned guys can get away with their hairlines being straight. He looks a lot better with it. If he had it done with HIS then he may have browsed these forums. He may still do so. And if he does.....Yousef - Your SMP looks great. No need to wear that hat anymore mate.